Pictured, in the back row, from left are Julia Hill and Nikki Walker. In the second row are Mallika Asar and Livia Way. In the front row are WIU Assistant Professor of Chemistry Mette Soendergaard and Kimberly Oldenburg and Dalton Moss. Not pictured are Shawn Westley McClenahan and Gabriela Garcia. MACOMB, IL – Eight Western Illinois University students recently presented their research at the annual East Central Illinois American Chemical Society (ECI ACS) Undergraduate Research Conference. • Sophomore chemistry major Julia Hill, of Columbia, MO, presented "Nitrate and Phosphate Determination in Soil and Drinking Water at Spring Lake." Hill is studying for a career in a sampling lab. • Junior biology and biochemistry major Shawn Westley McClenahan, of Monterey, LA, presented "Separation Using Ilmenite and Aluminum Oxide" McClenahan intends to get his doctoral degree in biochemistry, and eventually joining the Navy's biochemistry department. • Senior forensic chemistry and foreign languages and cultures major Nikki Walker, of Lake Zurich, IL, presented "Synthesizing Group 6 Carbonyls for Reducing CO2." Walker plans to attend graduate school to obtain her doctoral degree in chemistry, and intends to move into the academic sector to teach chemistry at the university level. • Sophomore forensic chemistry Livia Way, of Plano, IL, presented "Analysis of Total Antioxidant Activity in Brewed Teas using the Prieto Method by Visible Spectroscopy." After Way completes her undergraduate education she plans on working in a crime lab at either the state or federal level. • Sophomore forensic chemistry major Dalton Moss, of Pekin, IL, presented "Total Flavonoid Concentration in Tea." Moss plants to enroll in the University's bridge program, which would allow him to graduate with both a master's degree in chemistry and a bachelor's degree in forensic chemistry in five total years. After graduation, Moss hopes to work in a crime lab. • Senior biology major Gabriela Garcia, of Chicago, presented "Determination of Transcriptional Changes Induced by a Novel Ovarian Cancer Targeting Peptide." Garcia plans to attend medical school and would like to specialize in aviation medicine. 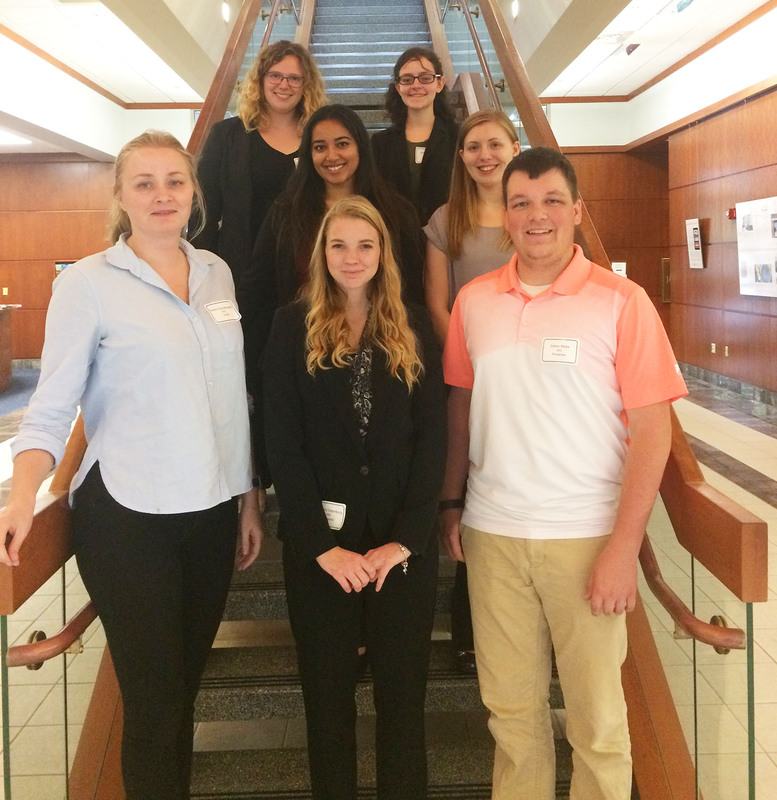 • Senior chemistry major Kimberly Oldenburg, of Macomb, presented "Soybean Secondary Compounds for Ovarian Cancer Prevention." Oldenburg plans to attend graduate school to continue a career in research. Also during the event, senior chemistry major Mallika Asar, of Lisle, IL, was invited to give an oral presentation about her research, "Phage Display Selection of Ovarian Cancer Targeting Phage Clones for In Vivo Near-Infrared Optical Imaging." Asar is enrolled in the University's bridge program, which allows undergraduate students to take graduate level courses, and get a head start on their master's degree. She is graduating in May, and will attend graduate school in the WIU Department of Chemistry next fall. Her career goal is to obtain an M.D.-Ph.D. degree and conduct biomedical research. For more information about WIU's College of Arts and Sciences, visit wiu.edu/cas.